In 1994 my wife, Melinda Shaw, and I founded the Puget Sound Community School (PSCS), a Washington state approved private school with an extraordinary philosophy based on trust that serves middle & high school students. At the end of June 2017, Melinda stepped down from the position she held at PSCS for 23 years. For the school and for me (not to mention Melinda), this was a huge change. To assist me with this transition, that summer I participated in a retreat offered by the Center for Courage & Renewal, one called Courage on the Threshold: Embracing Life’s Changes with Integrity & Grace. Upon arrival at the retreat at the incredible St Andrew’s House in Union, WA, I was greeted by Karen Harding, one of the facilitators, who gave me directions about how to find my room. I set down my bag and set up my bed, then went downstairs to meet some of the other participants. We sat on a deck looking out over the Puget Sound, iced drinks in hand. From this first informal interaction to when the retreat ended about 48 hours later, I was immersed in an environment of care and support that is unfortunately rare for adults to experience. Karen and her co-facilitator, Emily Chamberlain, held the space through their planned activities, all of which began with us considering and then reflecting on a relevant poem, along with their compassionate blend of empathy and encouragement. My favorite activity was led by Emily on Saturday afternoon. We gathered in the main meeting room to find that Emily had placed a number of photographs in the center. After a centering exercise, Emily asked us to take a closer look at the photos and select one to which we felt especially drawn. Upon inspection, it was clear that each photo had some kind of threshold or passage. I spent a lot of time looking, allowing myself to move from an impulse to just select something in order to complete the task and not take time away from others, to a form of conscientious surrender Emily and Karen had been encouraging us to allow. My experience became a partnership between me and the photo I would select. It may sound crazy to say, but it was both me finding the photo and the photo finding me. It happened almost as if a bright light shone down on the photo I was meant to choose. The picture was of a thin red door to a small white building. 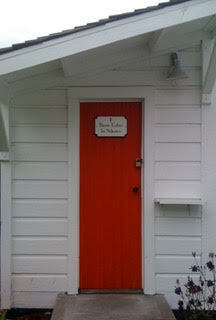 A sign on the door said “Please enter in silence,” yet the door appeared to be held closed by a padlock. The way the photo was taken, I couldn’t tell how one would access the door. Was there a porch, a front step, or something else? I considered the photo for quite a long time, then, following Emily’s directions, I wrote what I was thinking and feeling about it. As I wrote, a calm came over me and I realized that what the photo held for me was meaning having to do with being locked out from something safe and loving. As I reflected, I realized that I had been creating conflict in a situation that needed to be handled with a partnership mentality. Recognizing this, the padlock broke and I saw myself entering through the red door to a room bathed in warm light, my closest friends and family all present to greet me. It had both the symbolism one might associate with death, like entering heaven, or birth, like an incarnation into community. I returned to the meeting room, glowing from the experience. The next task was to share it with a partner. As it turned out, I was partnered with facilitator Karen. We took time sharing our stories with each other while walking around the amazing property, both that at St Andrew’s House and that next door. Karen’s ability to listen and simply hold my story without judgment allowed me to grasp it in a more concrete way. The selection of the photo, the time to consider the image, and the sharing of one’s experience, each of these components of the activity were necessary for me to discover meaning that carried to my actions at PSCS several months later. This is no small thing. 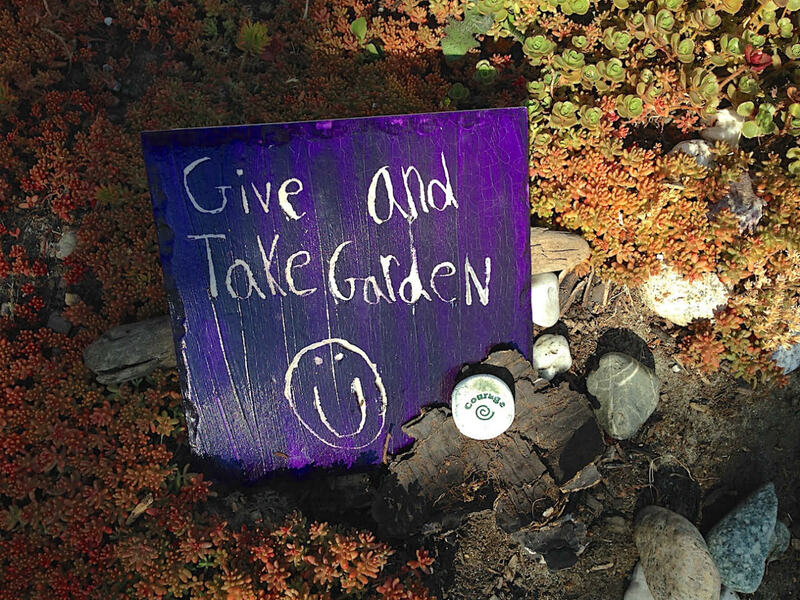 On the manicured ground around the sign were a number of trinkets and toys, things I decided a child had placed hoping some would be taken while inspiring passersby to give other items. In the closing circle, an idea I long held, that giving and taking, or receiving, are each part of a necessary system. One can’t give unless someone else is willing to receive. In receiving, one is giving the giver the opportunity to give. Put simply, what I experienced at the retreat was a form of giving and receiving at a core human level. One fed the other to the point of becoming the other, then to the point of them being the same thing. The system was fundamental all weekend, from the way Karen and Emily invited us to participate to how the participants treated each other. The giving and receiving included the location and the food that was lovingly and mindfully prepared for us.